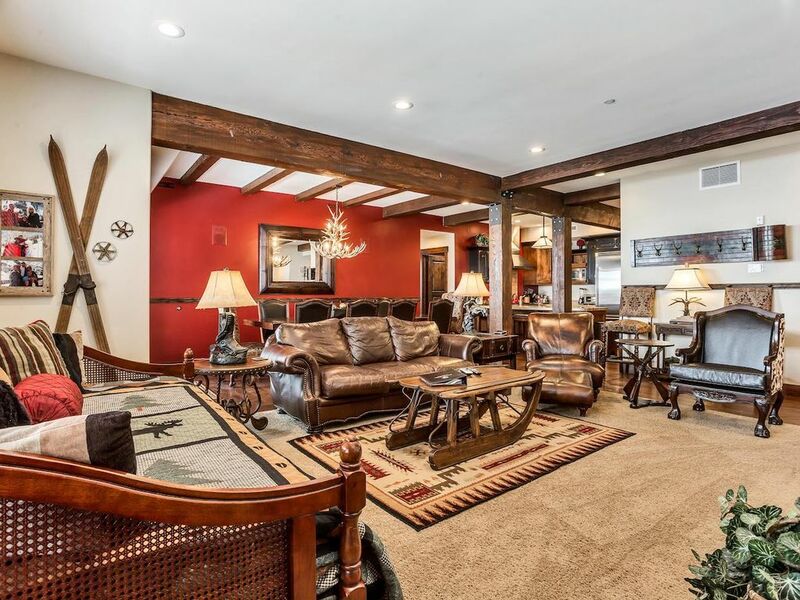 The condo is professionally decorated with upscale mountain lodge furnishings that have a western feel. No expense was spared in furnishing this luxurious condo! The master bedroom has a gas fireplace and a Select Comfort California King mattress. The two guest bedrooms have luxury mattresses also, which help ensure a good night's sleep after a day spent on the mountain or shopping Main St. The master bathroom has an incredible two-headed shower with glass walls, a Jacuzzi tub and large walk-in closet. One guest room has a king bed while the other has a custom-built queen-over-queen bunk, allowing 4 people to sleep in comfort while maximizing space. You will also find 32" flat screen, wall-mounted televisions in every bedroom. Spacious closets and well-placed hooks throughout the unit offer ample storage. The living area boasts a custom-built leather sofa with a specially-designed air mattress for additional sleeping options. A gas fireplace, large rustic beams and wood columns add substance and beauty to the living area. The living room has a daybed for lounging or sleeping, which also features a top-quality mattress. The fully-furnished gourmet kitchen has a keurig and comes complete with professional-grade Viking appliances, invites you to prepare amazing meals on cold, snowy nights. This property does have air conditioning in it. Two separate patios overlooking the slopes invite you to relax and immerse yourself in the natural beauty of the mountains. One patio holds your own private hot tub, while the other offers a top quality infra-red gas grill & dining area. So, as you cook out the kids can build a snowman in your backyard or play catch in the summer time! A super capacity washer and dryer are located in the large storage room, and allow for easy cleanup when you come in from the slopes or mountain biking. If you visit off-season, be sure to bring your golf clubs to play on the course right outside your door. Other amenities included in this unit are free WiFi and DirectTV. A rental car is not an absolute necessity for this condo, as the Park City bus system will take you almost anywhere for free. However, if you do choose to rent a car, we have a secure, heated underground parking garage available, as well as secure ski storage. Silver Star is Park City's newest luxury lodging facility located just 2 miles from Main Street and across the street from the Park City Golf Course. You are just minutes away from The Canyons and Deer Valley. Silver Star boasts its own chair lift and ticket center, and is home to the Sundance Film Festival's Headquarters. Other amenities located on the property include a quaint restaurant, a ski/bike rental shop, a relaxing outdoor seating area and a nicely-equipped fitness center with a heated pool. Whether it's snow skiing, snowboarding, cross country trekking, ice skating, summer hiking, horseback riding, backpacking, mountain bike riding, world-class shopping and entertainment, or simply star-gazing, Silver Saddles at Silver Star has you in the center of it all! We searched for months for the perfect year round vacation home, we found it at Silver Star in Park City, Utah. We traveled to Jackson Hole, WY, Keystone, Breckenridge, CO and Big Sky, Montana in our quest for a perfect all season resort for our family and friends to enjoy. Finally, after realizing Park City was top of the list, we purchased our 3 bedroom 3.5 baths condo. One of the most important factors in our decision was the ease in which we could fly from pratically anywhere to Park City, Utah, and most of the time you can ski same day!! Silver Star has its own chairlift and bus stops on the free city bus route. So, if you choose to not rent a car, you can always catch the bus or use the free Silver Star shuttle. This condo is all on one level, so there are no stairs to climb to the bedroom or kitchen, etc. It is also on the ground floor which means it has a nice back yard where you can build a snowman or play ball. You can walk straight to get on the lift or grab a bite to eat at the Silver Star Cafe! We also have an app you can download to your phone, ipad etc that will give you information on where to eat, what to do, etc in Park City and pertinent info on the condo and Silver Star Complex. Finally, we have an amazing personal concierge that will help you with groceries, tickets, activities or will help decorating for Christmas or special occasion to make your time as magical as possible. Good kitchen and large sized living/dining area handle a large number of people and does not feel crowded. 3 and 1/3 baths, private hot tub, grill, washer/dryer all make this a comfortable stay. The location is a very short walk to the Silver Star lift. If coming to ski you must know that this is your one access point to the mountain, so must plan your end of the day last ski run accordingly. It is not in the center of town, so a bit of a walk or free bus ride to get to main street where the shopping, dining, and apres ski entertainment is centered. Five stars, everything as advertised. This condo was lever to for three couples. Plenty of space to be by ourselves and together. It is fully equipped with anything you would need and there were many starter items for us. The communication from the management was excellent and the underground parking is a plus! Awesome!! I am so glad that you enjoyed your stay at Silver Saddles! Isn't it a beautiful condo? Just give us a call when you are ready to come back! Share about your stay on our Facebook page! Thank you for taking the time to leave us a review! We had a great stay in this condo. If you are renting for a ski vacation the access to the Silver Star lift is great, about 80 yard walk down an access road directly behind the condo with an easy blue run to get home. My suggestion is to plan your trip when this lift is open (late December) because the shuttle ride to the main resort to ski leaves a lot to be desired. Leaving in the morning would require a bit longer walk to the bus stop but is definitely doable. However, the crowds at the end of the day and bus route may take you a while to get back. It is only a .8 mile walk from the main resort to the condo so renting a locker at the main resort for your skies and walking home would be another option. With that said, this condo is one of the best ski condos we have rented and is as nice as advertised. Awesome!! Thank you so much for the great review of your stay at Silver Saddles! We are so glad you enjoyed your time there! Give us a call when you are ready for your next ski trip! We stayed the week after Easter. The unit was large, well-maintained, clean, interestingly decorated, and stocked with everything we needed. Super easy to get in from the parking garage -- just one floor up on the elevator. It's in building 4, which puts it a bit further from the Silver Star lift, Cafe, ski shop, etc., but that just means a 2 minute walk rather than 1 minute walk over the lift. The property managers were really good at providing all the info we needed ahead of time (the garage, elevator, and door all work with codes, not keys), and there's an app you can use that centralizes the key info. Only complaint is that they need a new dishwasher, as the current one is a bit beat. Thank you so much for the great review! We are so glad that you enjoyed your stay with us! The code access is so much better than keeping up with keys! Check out our Facebook page and let others know about your wonderful trip! Beautiful condo with everything you need. Love the master bed and hot tub! Great location, staff was awesome! We are so glad you enjoyed your stay! Thank you for taking the time to leave a review. Hope you stay with us again! Very nice, spacious condo, only about 40 yards from the Silver Star lift. Would definitely rent again. Yay!! We are so glad You enjoyed your stay at Silver Saddles! We hope you book with us again next year!